Once, an historic landmark and the most photographed house on Prince of Wales Island, this beauty of a float house was abandoned after many years of neglect. I knew the last, eclectic residents that lived there and witnessed it beached many times. Each time it was laid on the shore by the tides, more bolts would loosen, boards would separate from the structure, even to the extent that it was tied with ropes to keep it together to survive another impending tide. It was quite the site to see when first coming into this tiny fishing town in Southeast Alaska with it’s brilliant blue paint silhouetted against cloudy skies. Many times I would drive by and see a group of people with cameras snapping photos. I am sure there were all sorts of stories these visitors had to tell when they returned home. Here’s what the ole girl looked like while I lived there. Shortly after we moved, the city condemned the house and she was put to rest. 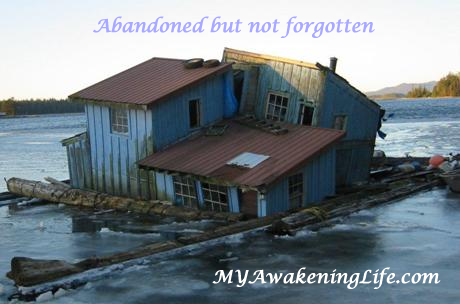 Yes, abandoned, but not forgotten. Good memories live on! Oh my – it looks like something from The Cat in the Hat! Poor thing is actually really interesting looking! Fun post. I hadn’t thought of it that way, but yes definitely Seuss-esk. The inside was just as interesting. The lady of the house was a book worm and the entire living room was bookshelves filled with books. She claims to have read a book a day and guess what? She was the librarian at the school. Interesting house, interesting float house dwellers. Oh and they lived in that tiny house with four huge dogs. Hello, thank you for this post! We built this float house and moved it to the road because the trek down the beach or woods with a newborn baby boy and our 7 year old daughter was difficult in the Craig winters. 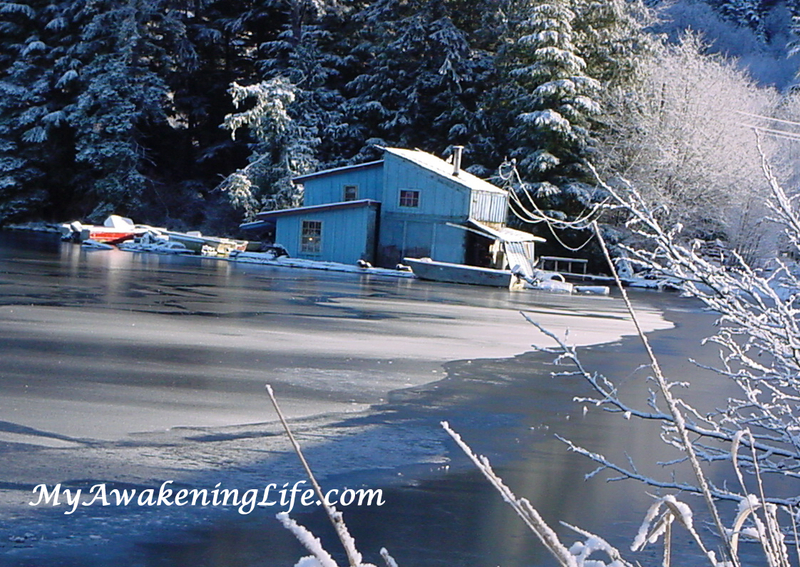 We loved our home and the life that we led there, in spite of not having electricity or running water. Just before we moved to Portland, we established a water line from the cement plant and put in the tankless water heater so we could build a shower. This float house was filled with love from the moment the first board went up. At one point, I had a sign on the front that said, “And they all lived together in the crooked little house.” Sad to see it go, but our memories live forever!